I am not one who is big on taking vitamins or even drinking water. I have always wanted some kind of flavor in whatever it is that I am drinking. Lately I have been drinking more water but I have to have lemon in it once again I need flavor. 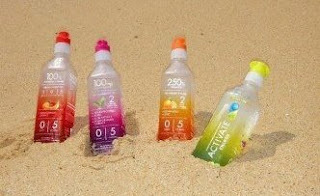 Well let me introduce you to a new kind of water that has recently came out Activate Water. Did you know that vitamins and other healthy ingredients lose potency sitting in water? Activate water has found a way to stop drowning the vitamins in drinks. 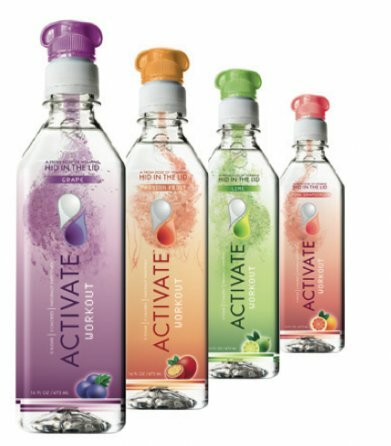 By storing the active ingredients inside their unique, patented cap, separate from the water, ACTIVATE’s vitamins stay fresh, potent and offer a convenient way to get a healthy dose of the nutrients your body needs. I was hesitant at first to try this water since one I'm not a big fan of water and two I didn't understand how you could keep the vitamins in the cap. Well I was pleasantly surprised. The water looks almost like juice after you release the vitamins into it. I really enjoyed it and I loved the fruit punch flavor I'd have to say its my favorite. I'd like to tell you about this great idea that Activate had and tried out. So here is a question for you. 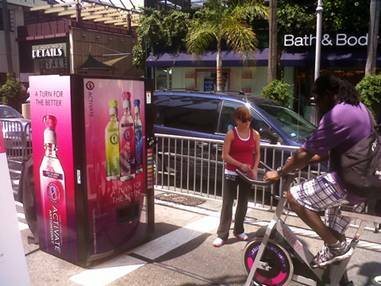 Would you pedal an exercise bike for a thirty seconds if it meant you would get a drink for free? Well Activate decided to try just that... Passersby's pedaled an exercise bike attached to the vending machine for thirty seconds to release a free bottle of ACTIVATE. 1,250 bottles were distributed, the retail value of which will donated to Nourish America in support of nutrition for pregnant women. The final donation amount totaled $2,240. Thanks for sharing Activate, I've never heard of it.